Welcome back to Chuck who has been missing due to some health issues. We love you Chuck, and are glad to see you back!!! 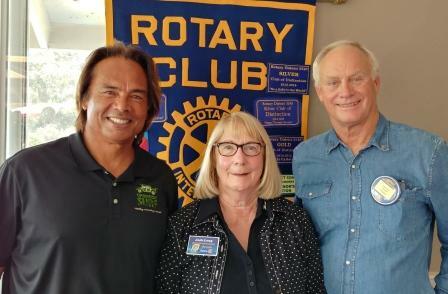 Guests of Rotarians: Melissa brought friends, Morgan Wise and Emily; Tom Hay brought his friend, Larry Burke and our speaker, Van Curaza; Nelson Paloma, a Financial Advisor at Edward Jones, MB also visited our Club today. A card for Claire Grantham, who had recent back surgery, was passed around. Steve Knuckles announced that the Fire Dept. will be giving free flu shots on Sunday, October 28th from 1–4pm at the Fire Dept. Scott Collins and Jack Keely were both presented with their yellow badges... a very quick transition for these men - thanks for stepping up and being so active so early in your membership!! In an effort to get a tad bit organized, some of us cleaned out the Rotary cabinet in the meeting room last week; on Wednesday, October 10th we will meet at the storage shed to ruthlessly clean it out; we’re hoping to follow this up with lunch at Mi Casa, the Mexican Restaurant in the same parking lot. 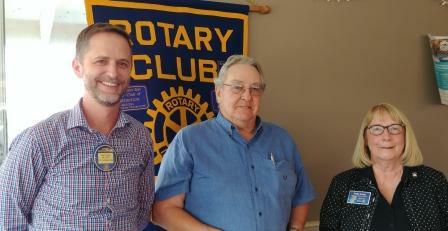 Katherine Gillen was formally announced as our President Elect Nominee for the 2020/21 year. Judy Salamacha sent a picture of Nahayo who we helped with medical school expenses. He is now officially a doctor. What a blessing to be able to help others attain their goals. Judy also said she and Jude will be going to the District Conference to learn more about Human Trafficking. Jude had Opal’s very informative book with her to sell at a cost of $16.00. Elsie is making tee shirt dresses to sell in the “Million Kids” Etsy shop. Check it out ....jewelry and other handmade things will be sold to help fund this worthy organization. Vacancy on the Board of Directors - we are in need of an Awards Chair. Please volunteer - Jude will be happy to help you with that. A.G. Rotary is having a drawing for a 2017 Ruby Red Mustang; the tickets are $20 with a maximum to sell of 3,000. So far 1800 have been sold......so the odds are pretty good. Tom Hay introduced our speaker today, Van Curaza. On October 9th thru the 15th we will be welcoming our wounded military heroes to the Central Coast for Operation Surf! Van started by thanking the veterans and first responders. After battling and overcoming addictions in his own life, he was given the opportunity to work with veterans and now has his own organization: ”Amazing Surf Adventures”, which is a non-profit located in Avila Beach. 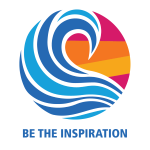 Their mission is to help those in need overcome their challenges through the power of surfing, ocean education, and fellowship. In 2017, they welcomed 15 heroes to the weeklong surf therapy event in Avila Beach and Morro Bay. These veterans come on this all expenses paid “vacation” to learn surfing with world class surf instructors and at the same time, build trust and self confidence. They will be at the Rock in Morro Bay on October 14th and 15th. “Operation Surf helped me realize I’m not disabled, I’m just differently abled” said Martin P., an Operation Surf Family Member. Jude closed with giving Van a “Be the Inspiration” pin. We appreciate his honesty in sharing his life with us. Our speaker next week will be our own Andrea Lueker, be here for her exciting presentation. The 50/50 was won by Doug who presented it to Van for his Operation Surf ventures. Jude beat Gary to the punch and told a great story on herself. It was funny!! See you next week! !